Amy Studebaker Design, Platinum winner, More than 250 square feet. 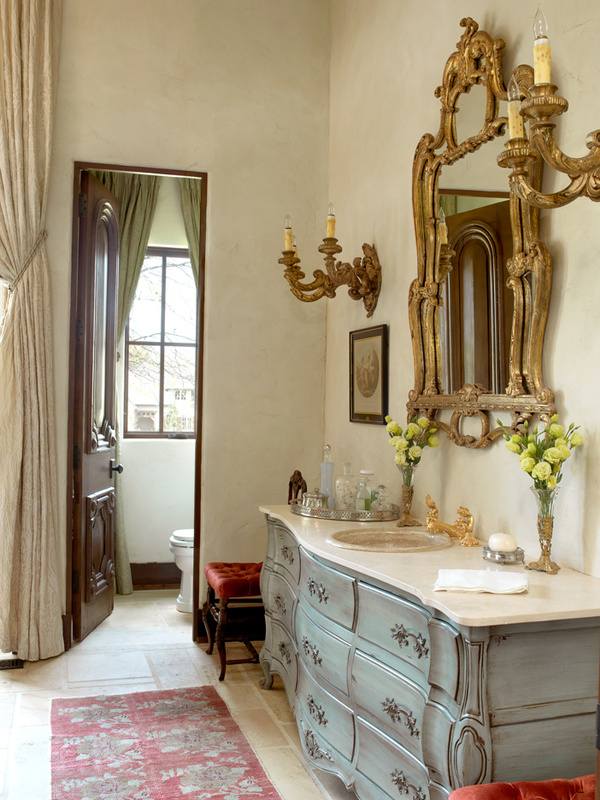 When pulling this project together, Amy Studebaker of Amy Studebaker Design made sure the master bath was not only functional but unique, with an Old World Tuscan feel. To enhance that feel, architectural details such as beams on the ceiling with carved supports as well as a beam extending from the wall to enclose the shower head were added. Concrete pavers set with wide mortar joints also set the feel for Old World charm. Challenged to keep the space unique, Amy opted for antique/vintage pieces for both vanities. The wife’s vanity is a wonderful shade of blue enhanced with a deep cocoa-bean glaze topped off with an antique mirror. A Sherle Wagner cherub faucet sits atop the travertine counter. On the husband’s side, an antique serving piece with dolphin handles gives the space a distinctly different feel from his wife’s side. Given its own niche, the stone tub adds textures and interest to the bath. To add warmth and a bit of drama, creamy white silk damask drapes frame the entry to the tub space. Melding today’s modern luxuries with unique pieces created an old world ambiance. 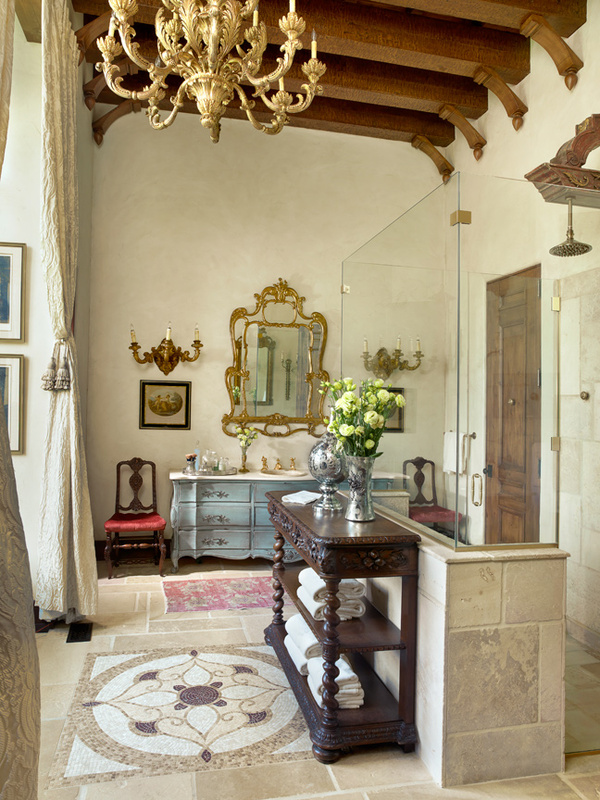 Elegant creativity is abounding in this master bath. The ceiling beams are beautiful. In the bath area, the drapes framing the tub are a nice touch as is the small table next to the tub. You feel the luxury of the space, sometimes forgetting you are in a bathroom.